In a small bowl, mix together the brown sugar, paprika, onion powder, garlic powder, chili powder and salt. When well mixed, liberally apply the rub to all sides of the pork chops. Add vegetable oil to the Instant Pot and set on saute mode. When oil is hot, add pork chops and sear on each side for 2 1/2 – 3 minutes. Then remove pork chops and set aside on a plate. Press cancel to stop the saute mode and add water to pot. Use a wooden spoon to scrape all the bits off the bottom, then mix in the 2 tablespoons of bbq sauce. Add pork chops to the liquid, leaving space between each if possible, secure lid, set seal to “sealing” and pressure cook (manual) for 10 minutes. When cooking time is complete, let the pressure naturally release (takes 10-15 min). Once pin drops, carefully remove lid and transfer pork chops to a foil lined baking sheet. 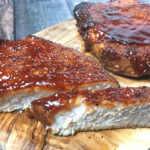 Brush bbq sauce on pork chops and place under broiler for 5 minutes. Serve immediately.